James Henry “Jim” Webb, Jr. was born on the 9th February 1946, in St. Joseph, Missouri USA of Scottish and Irish descent. He is best known for being a politician, who has served as the senior Senator for the state of Virginia, as well as Secretary of the Navy, and Assistant Secretary of Defense for Reserve Affairs. Beside that, he has also been a counsel for the United States House Committee on Veterans’ Affairs. He is also recognized as an author, journalist and filmmaker. Have you ever wondered how rich Jim Webb is, as of mid- 2016? According to authoritative sources, it has been estimated that Jim’s net worth is as high as $7 million, which has been accumulated mostly through his successful career as a politician. Another source is coming from his activities as a writer, journalist, and filmmaker. 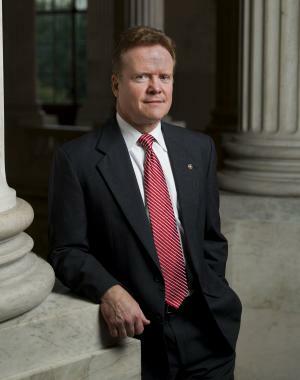 Jim Webb was raised with three siblings by his father, James Henry Webb, Sr., and his mother, Vera Lorraine. The family moved very often as his father served in the U.S. Air Force, so Jim attended a number of schools. He matriculated from high school in Bellevue, Nebraska, after which he enrolled at the University of Southern California, where he was on a Naval Reserve Officers Training Corps scholarship from 1963 to 1964. Later, he joined the United States Naval Academy, where he was a member of the Brigade Staff and the Brigade Honor Committee, and graduated in 1968. Later, Jim was a student at Georgetown University, where he earned his Juris Doctor degree. Before his political career began, he served in the US Marine Corps during the Vietnam War, winning a Navy Cross, Silver Star and two Bronze Stars for heroism, and two Purple Hearts for injuries, which eventually saw him medically retired in 1972, after serving in the Secretary of the Navy’s Office. To speak of Jim`s political career, in 1984 he was appointed as Assistant Secretary of Defense for Reserve Affairs under President Ronald Reagan, and served in that position until 1987. After that, he was appointed as the United States Secretary of the Navy, serving from 1987 until 1988, both of which increased his net worth. After that he dedicated himself more to writing, and sponsorship and support of other politicians, but returned in 2006, and won the election for Senator of Virgina. He served on that position until 2012, then decided not to stand again in the 2012 election. To speak of his writing career, Jim has published articles for several notable magazines, including USA Today, The New York Times, The Washington Post, Marine Corps Gazette, Wall Street Journal and many others, all of which have added to his net worth. Furthermore, he has published ten books, some of which include “Fields Of Fire” (1978), “A Sense Of Honor” (1981), “Born Fighting: How the Scots-Irish Shaped America” (2004), and “I Heard My Country Calling: A Memoir”(2015), all of which have significantly increased his net worth. Also, Jim wrote a story on which the film “Rules Of Engagement” was based, and as a result he was credited as executive producer of the film, increasing further his net worth. Regarding his personal life, Jim Webb has been married to Hong Le Webb since 2005; the couple has a child together. Previously, he was married to Barbara Samorajczyk (1968-1979), with whom he has a daughter, and he was also in marriage with Jo Ann Krukar (1981-2004), with whom he has three children. Parents Vera Lorraine Hodges, James Henry Webb Sr.
4 Webb's son is a U. S. Marine who served in Iraq. Webb wore his son's old combat boots every day during his 2006 Senate campaign. 5 During his service as a Marine in Vietnam James Webb was awarded the Navy Cross, the Silver Star, two Bronze Stars, and two Purple Hearts. 6 Senator-Elect for the state of Virginia in the 110th Congress. November 2006. 7 Served in Vietnam with U.S. Marines. 8 Served as Secretary of the U.S. Navy under Ronald Reagan. 9 Graduated from U.S. Naval Academy in 1968.